Too busy to shop? Too tired to cook? Not sure what’s healthy? 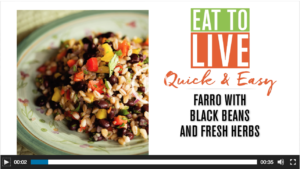 From Joel Fuhrman, MD, the #1 New York Times bestselling author of Eat to Live and the instant New York Times bestseller Eat to Live Cookbook comes the Eat to Live Quick & Easy Cookbook, 131 super-delicious, easy-to-prepare, incredibly healthy recipes.